The Canon PowerShot N I've been playing with abandons the time-honored soap bar format for cameras for a small (almost) square box, and now Polaroid is getting ready to join the square show with the Socialmatic. Warning: this is a camera intended for launch in early 2014, and thus everything that's being claimed by the parties involved is subject to change. In particular, the price seems overly aggressive for all the things that are stuffed into the unit. The Socialmatic actually has a bit of interesting history behind it, as it started as an independent design concept in 2012 (ADR Studios) that has now been licensed to PLR IP Holdings for production under the Polaroid name. Why Polaroid? 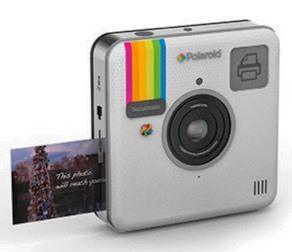 Because the little square box is really a Polaroid Zink printer built into an Android-based compact camera. For those that aren't aware of Zink, it prints 2x3" photos without ink; essentially an outgrowth of the old Polaroid technology brought forward. The size is a bit big, perhaps twice as tall as a typical smartphone and just as wide, plus it has to be deep enough to allow the Zink packs and printer to fit inside, too. So, unlike the far smaller Canon PowerShot N, which can almost be worn as jewelry (and Canon encourages that with their necklace-like neck strap), I'm not sure the Socialmatic is even pocketable. Under the skin along with the Zink printer will be a 14mp front-facing camera and a 2-mp rear-facing camera, a GPS logger, and WiFi and Bluetooth to connect you to the world. All supposedly for US$299. One curious aspect of the Socialmatic I'm watching more closely given all the discussion about privacy these days is the QR code aspect of the camera. I actually love this sort of conjunction, where a product in a mature category meets a new technology normally associated with a different category. Here the QR codes are unique to a camera and unique to a photo, allowing for photos (and technically, users of the camera) to be tracked. I'm under no delusion that there's any sense of being able to keep much of what one does private these days, but as the Snowden revelations et.al. have shown us, all this data that our devices are generating can and will be tracked in ways that you might not want or agree with. The question is always whether the usefulness of such technologies outweigh the privacy losses that come with them. If you want to get a little more sense of the project, see the Socialmatic's Web site.